Beyond Books is an interesting collection of short features...Take off from the printed page and discover books in different forms in the realms of art, fashion, decor and much more. The stories in this section, highlight products and ideas that start off from the book, but fly much beyond! An all-day café with a charming literary vibe- this is what Fable is all about. Fable takes you on a pleasant journey across the world of books. As you enter, there is a wishing well, reminiscent of the well which features in so many popular childhood tales. “The decor concept was developed to integrate fables and stories visually into the space,” explains Minnie Bhatt, Creative Director, Minnie Bhatt Design. Bhatt is especially known for her creative and off-beat spin take on restaurant décor. Bookedforlife moves about the space with one overarching goal- to spot all things bookish at Fable. The book lamp is a clear highlight, as is the open book wall. “Once you enter, you cannot miss the theme that the décor revolves around. The Fable Wall is the main highlight. It is made up of over 50 novels with an artistic illustration across them with the help of my artist friend Prashant Keluskar. A quirky artwork painted on it, of deer antlers riding a bicycle makes it a very interesting installation at the restaurant,” explains Bhatt. The Reading Lamp has an authentic paperback base! While these two elements seem apparent, we look around to see other design elements that also evoke a literary theme. Since the whole idea behind the concept was fables Bhatt stuck to the childhood stories and fantasies that evoke childhood memories. For instance, they converted a doll house to a service counter. They also made a writer’s desk with a customized vintage telephone comprising stacked books, just like an add-on to the space. Book inspired décor comes as a breath of fresh air in an era dominated by gadgets and devices. Perhaps, as one sits at Fable, sipping some coffee or eating a meal, a look at the creative bookish representations may just (re)kindle that desire to read a book! How can one use books as décor? If you’re looking at decorating your house with books, you’ve got to read this! Even if you have just a few books at home, dress them up with interesting bookends – they will turn your book collection into a good-looking artifact. Some people arrange the colorful spines of books in a pleasing manner. Some uniformly cover all the books. One can play around with shelf arrangements mixing horizontally and vertically kept books, interspersed with showpieces. You like to welcome the new season and festivals with a touch of décor, don’t you? Books on festive topics do look good when placed with other knick-knacks. For instance, placing Christmas books around the Christmas tree and so on. Release books from shackles of shelves! Display different books at key spots in the house. For instance, in the kitchen, display your range of cooking books. In the bedroom, display novels and so on. Stacks of books at varied places are an easy way of incorporating them into the décor. Use odd numbers for best visual effect. How about piling up books with a lamp or as steps or even using a collection of well-bound encyclopedias as mantel pieces? Place a stack on the bed side table and place a lamp over it. Or, stack them on the side table and place your photo frames on the pile. Stacks of books of varied heights are useful for creating different effects. These metal shelves help in stacking books against the wall…and also add an interesting visual element. This ever popular type of book is an age old way of decorating by using books. Leave it open or stack it up on the centre table. It allows guests to peek into your interests and is a great conversation starter! You can have a very personalized way of displaying books. Book lovers can get really creative! In this day and age of personalization, there are many ways you can design your own book corner. How about a bookshelf with names of famous authors inscribed on the sides? Or maybe a script in calligraphy on the bookshelf? Or, using books as a base of a lamp? Maybe, one could turn an entire wall with decoupage of comics! Ideas are limitless! Open up your mind and let them fly! Here, books have been stuck to the wall to create an installation. Books can be great raw materials for creating wonderful works of art. Once the book is converted into a sculpture you can’t read it…but it is a way of using books as décor! Book decals are a nice way of incorporating book decor without actually using the books from your collection. If you want a little more inspiration, do refer to the book, Novel Interiors, which is a beautiful guide to doing up your house with inspiration from classic works of literature! So whether you are a crazy book lover or you just love the way they look, you can achieve a unique style for your house by using books for more than reading! How do you plan to use your books as décor? We are all familiar with a rich text environment. Look into any primary classroom and you will see that it has some elements of a print rich environment. What is a rich text environment? Way back in 1989, researchers Neuman and Roskos conducted a study. They made a classroom environment more print rich. They studied the children before and after this change. They found that after the experience of print, children used twice as much print in their play than they did prior to the changes! Parents can benefit from this knowledge and turn their children’s rooms into havens for learning by creating a rich text environment. A rich text environment means much more than having books all around! Here is how you can design a home environment to make it rich in text. Every child will benefit from good display space. This is also the best way to create a print rich environment since you can display any kind of print you want here. Ideas for what to include here- age appropriate charts, labels, signs, timetables, quotes, written text and work by the children. A simple display board provides much versatility. Choose an option that fits in with the size of empty wall space available in your room. Soft boards, magnetic boards, white boards and chalk boards are the common ways to provide a space for display. Nowadays we also get chalkboard and magnetic paint. Use them on any blank wall or even the wardrobe doors! Having boards on the wall is not in the only way to display texts and posters. Display spaces can be created quite innovatively. One can use colourful strings and ribbons across the room and display stuff on fancy pegs. Other spaces that could be utilised for display include the back of the door and the space above the study table. It is also important to ensure that children are able to interact with the display. For example, a child is more likely to look at a chart that is placed at their height. When a child starts recognizing letters, it is the perfect time to label stuff in the room. This enhances and stimulates their interest in reading. However, one must make sure that the print is clear. Labelling is a classic example of how something small makes a big difference. If labelling is combined with images, it would have the maximum impact. Use chalkboard labels to label stuff. You can play around with chalk colours and rub and rewrite on them when required. Playing around with colours for the labels is a good idea. For very young kids it is better to use solid colours like red or black for labelling their stuff. Later on, you can experiment with the numerous options that the markets are crowded with. Well, this is something that obviously goes into making a space a rich text environment. A little reading corner will give the best advantage of a print rich environment. A good book-nook should be well lighted. Ideally, a child should be able to access books by himself. Books must be well organized. A seating space for cuddling up with a book is not so bad either! Rotate books regularly to ensure freshness. Today, the market is filled with great wall décor options. For instance, wallpapers that have informational text or maps are great for a child’s room. Interactive wall décor through reusable wall stickers is another option. These come very handy there as they are repositionable. They can be peeled off as soon as the child outgrows a learning phase. They do not leave any damage to the walls. For example, an alphabets wall display can be easily converted to nursery rhymes or an animal recognition chart the following year. They are also versatile and can be used on everything from painted walls, furniture, glass, windows, and doors to bathroom tiles – so one can be creative with their display options. This is a great way to personalise a room and turn it into an interactive play area. While map wallpapers are a good idea, map prints themselves work great. Maps look great in a child’s room and they have so much packed into them. In addition to all the print on the map, they open up literally a world of possibilities for discussion. Another subtle touch is to add a globe. It’s a great accessory to have. Maps look great, and there are some fantastic decals available in the market. The above changes can be incorporated in your child’s room or your own if you share space with your child. One can keep these factors in mind while redesigning or creating a new room. But, the most important thing to make these design ideas work is to use them for the way they are intended. Different children respond to print-rich environments differently. For some merely having the stuff there is enough. For others, parents need to help the child interact with the room to benefit from it. A reading nook will work if your child actually sits there and reads as would a display space, if your child actually looks at what is put up there! As always, design works for those who help themselves! Well, here’s to a rich text environment then! Keya Shah, the founder of The Doodle Soup may be only 21 years old, but is already steering a promising and successful entrepreneurial venture. The Mumbai gal had always been into numbers (she is pursuing a career in Actuarial Science). Hence, this creativity-inspired and fueled venture must have come as a pleasant surprise to her as well! Bookedforlife chats with Keya Shah, Founder of The Doodle Soup to know more….. I have always been more inclined towards math and academics and didn’t do well at art in school. It is therefore a bigger surprise to myself than anyone else that I own The Doodle Soup today! But, I absolutely love my work. Just over two years ago, I made a few posters featuring doodles of my favourite books and TV shows only to decorate my room, nothing in the least entrepreneurial. It was my best friend, Devanshi, who pushed me forward, saying that my work had market potential. Thereon, I signed up as a volunteering artist for Postergully where I all I did was provide artwork on my end and they sold the merchandise, in exchange for which I was paid a commission. The notebooks and coasters did exceptionally well here and I started getting requests for custom doodles. That’s how I started The Doodle Soup, a separate independent e-store as a means to give people what they actually wanted in the gifting sphere rather than buying generalized not-so-special products. I’ve always believed that I have been extremely lucky for this opportunity to fall into my lap! The book community is a special place. Not only in India, but throughout the world, books have the power to bring people together and I’m hoping my products do that in some way too. I’m an avid reader and so I always represent myself through my work. The literary world gives everyone a reflection of what they represent and in the words of JK Rowling, “The stories we love best do live in us forever.” My literary products needed almost no marketing as the vast community has done all the marketing for it. My Harry Potter doodle is my favourite one mainly because it was the first one I ever did. It’s been years since the last book released but that novel has found its way into too many hearts and I’m happy my doodle delights so many as much it delights me! The Game of Thrones design has of course been pushed after the release of the TV show but yes, Harry Potter, Game of Thrones, FRIENDS, Stranger Things and the Bibliophile mugs are my best sellers! The library stamps are my most treasured products. Not a lot of stores in India offer rubber stamps and even fewer are into customized ones! I’ve always been a child who wrote her name in all the books she owned and I’ve also been at a place where books I’ve lent have never been returned. This basic frustration that I know every reader has faced at some point led to the idea of bookstamps. So simple, yet so efficient! I’ve made sure I have a heavy catalogue to choose from that caters to every type of reader. This has grown leaps and bounds into wedding stamps and company stamps too! The day I released the Bibliophile mug, there was a frenzy. It was heartwarming but it also made me extremely nervous to see 100+ messages inquiring about the same! The literary themed products (especially the general Bibliophile Mug and the library stamps) come straight from my heart. The next design I want to create is definitely one for Lord of the Rings. There have been requests for general ones for say, John Green, but I wish to cover the older greater novels first before pleasing the younger crowd. An Agatha Christie and Literary Classics theme mug and notebook set is under way as well. Hopefully, I can collaborate with many more book boxes from India. I did one in November with IAAK Box for rubber stamps and it was great! Well, for now it seems that The Doodle Soup is all set to make literary inspired products. From the book onto a doddle….that’s the way it goes! You can look at the FB page of The Doodle Soup here. Ready for an “Atrangi” twist to your library furniture? It is the name that gives it all away. Atrangi, a word that means strange or unusual is quite apt to describe this new line of typographical furniture designed by Harshi Shah, Founder of Atrangi, a Designer Furniture Brand. The Rani-ki-Vav or Queen’s Stepwell is the original source of inspiration for the collection. Her very first line of furniture pieces boldly challenges clinical minimalism and dives into rich Indian heritage. The result is a mesmerising and statement-making collection. The current line has been inspired by a famous step well located in Patan, in North Gujarat. The Rani ki Vav (Queen’s Stepwell) has a conspicuous architectural style. What inspired you to translate the design ethos of Rani ki Vav into a font first, and then onto furniture? It’s one of those things that literally just happened. I was in my final year and we had to design a font. I happened to discuss Rani Ki Vav with my professor Mrs. Mansi Keni and how it had been added to UNESCO’s Heritage site earlier that year. She encouraged me to design a font around that theme. I began thinking and designing the font and researching more about it. By the end of the month with the graphic font ready, I told her I’d like to make a piece of furniture because anything else would become too mainstream. That’s where it all began. What are some of the specific design features of the Rani ki Vav that you have captured in the collection? The Vav, that is, the well. That is what makes Rani Ki Vav. I sat with architectural plans of the place and then tried to incorporate the construction of well in a way that it makes a flow throughout the design. The sculptures on the furniture are all from the actual site itself. I have creatively juxtaposed them into the furniture. Lounge Rocker, the ergonomic chair recalls the unique shape of the step well, and also showcases rich sculptural elements of the Vav. Concept furniture is still at a nascent stage in India. How has the response to this collection been? This was a revelation to me as well. I am a Commercial artist who has specialized in typography. Initially, I viewed this theme and its furniture as nothing more than art pieces with usability. But, it was heartwarming to see that people still rejoice and appreciate our heritage. They appreciated the fact that the designs were rooted in something that was so uniquely Indian, so uniquely ours! What kind of wood has been used for the furniture? All the pieces are made in old teak wood. The hand carving and craftsmanship is too intricate for any other wood to be able to endure it. Old Teak wood is both a suitable and economical combination. Why do these pieces fit in perfectly for a home library area? The inscriptions on the lamps allude to “light”, symbolically referring to the light of knowledge! A library is a world it itself, full of cultures and languages. Some of these few pieces fit best at a library. Take for instance the bookshelf. Pustak in Hindi means book. The bookshelf – Pustak is quite a giveaway, right? We also have a new addition to the bookshelf that reads “Kitaab”, which also means book. The lounge rocker, is one of my favourites in the lot. It is also the one with the highest sale and demand as it is very comfortable and powerful in design. If I had to design a library corner in my house I’d make one using the lounge rocker, center table and lamps. The inscription on the lamps read Prakash, which means light in Hindi. With these ‘Atrangi’ pieces in your book-nook, it is sure to become a literary corner- well, literally! The bookshelf is clearly one of the star pieces. Another version has the word “Kitaab” written. Barrels cannot be square. So, when a brand like Square Barrel comes along, we can expect stuff that is clearly out-of-the-box! Some objects force you to look twice because they have a differentiating element. These are the kind of products designed and retailed by Pratik and Shikha Barasia, the Founders of Square Barrel. Translating their vision of ‘funky’ and ‘quirky’, they create objects that are out of the ordinary and very charming indeed! 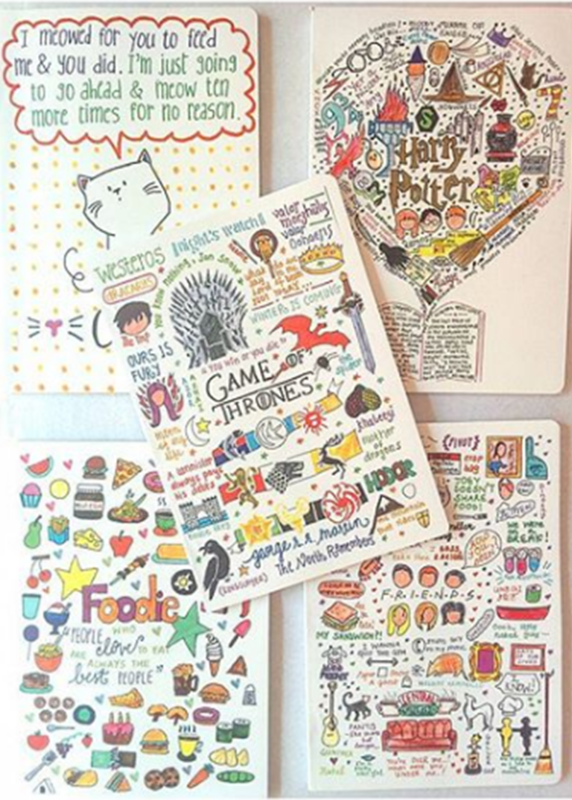 Here are some of their products that any book lover would swoon over! The Open Book Cabinet, with handles inspired by the leaves of the pages of a book. Nothing like an open book to entice a book lover! This design was created for all book lovers. The handles of the cabinet have been inspired by the leaves of a book. It is a simple unit with a twist which is enough to add a funky element to the piece. The piece is made from Marine Plywood. Polyurethane paint and digital printing have been used for the design. A perfect cabinet to store books! The Hungry Caterpillar anyone? This design was created with the desire to create a furniture piece that didn’t sit only on the floor but crept up the wall as well. After many sketches and discussions, they created the caterpillar. Cute as it may look, this is a sturdy piece that is made in solid teak wood. Chenille velvet fabric on the stools makes for comfortable seating as well. The Caterpillar Bench, a furniture piece that does not sit only on the floor but creeps up the wall as well! What’s a book nook without a rocking chair? The small twist, if you notice carefully, creates all the fun. They have simply changed one arm to a walking stick! Settle down in this cozy teak wood chair for a reading session! The scroll is an object that recalls elements of the past. This hand-painted mirror is carved in the shape of a scroll. The art is inspired from the style used by tribals in northeast India on textiles. Let the Superhero bear the weight of all your books! The Superhero is here to carry the weight of all your books! The aim was to create a bookend which didn’t need two sides to hold all the books in place. They just wanted support only at one end. The tilted angle which was required for this in turn helped them come up with the superhero concept! Books take you round the world. don’t they? Why not have some iconic global design to host your homegrown collection? This book shelf steals the show completely! So, the next time you want to amp up your book corner, remember to add that touch of quirk with Square Barrel! The Telephone Booth bookshelf is a statement-making book storage unit. We all love the magic that things of the past hold. The Conferro Heritae Archive is one such treasure trove. The Archive holds about 350,000 vintage newspapers, about 4 million vintage advertisements, dating back upto the19th century from not only India, but the world over, making it one of the largest and the most diverse private collections in the world, along with tens of thousands of books, magazines, cinematic memorabilia, vintage cars, watches, stamps, maps, vintage textile, fine art, tribal art and about 17,000 vinyl records to name a few. Extensive research is the basis of creation of the archive and thus has some of the rarest books, newspapers, vinyls, Bollywood memorabilia among thousands of collectibles in its purview. Bookedforlife chats with Ajay Seth, Founder of the Conferro Heritae Archive for a glimpse into the past. When did you establish Conferro Heritae? The company was founded in 2012. However, we’ve been collecting Art & Collectibles for decades now. Conferro Heritae Archive has an eclectic mix of art and collectibles. Vintage newspapers also feature in the archives. You have introduced an interesting angle to this- gifting the vintage newspaper of the day/date a particular person is born. How is this idea being received? It’s been incredible! It was of course something rather unique that we brought to the Indian Market, but the way it was received was absolutely fantastic! Who doesn’t want a piece of the day they were born, or rather any significant day in their life! Can you talk about the sourcing of the collectibles? It is of course an expert’s domain and we need to understand the historical significance, rarity, etc. of the collection that we’ve built from various parts of the world. It is also a long process as all the Art & Collectibles are only acquired post all necessary authentication and documentation has been verified. What is the oldest newspaper and magazine that you have? The oldest newspaper would be the ‘India’ Gazette from 1906 which was published in the UK, we also have some from the 19th century which have not yet been archived. Our oldest magazine would be the magazine ‘Pictures’ – 1920. You also have a collection of vintage advertisements and Bollywood movie posters. What do you think appeals to collector’s when it comes to these categories? Posters have a historical as well as aesthetic value. They are works of art which represent the rich cultural heritage of our movies, reflecting the vibrancy as well as socio-economic conditions of an era. Needless to mention, they are often a significant nostalgic value for a collector. Vintage Advertisements are something a lot of people resonate with. It is an extremely diverse and easily relatable subject. It’s a foray into past times and vintage ads are artworks in themselves. Advertisements are collectibles, which portray multiple dimensions of history and culture both at macro and micro level. They are historic entities for both a country as well as corporate world, signifying its own history, the marketing strategies employed, level of globalization, competition, etc. Do you also have any rare books as well? We feel blessed to have been able to acquire an incredible number of rare books, dating back upto the 17th century. We’re hoping to showcase and auction some of the rare books from our collection over times to come. We may not have the space for a full-fledged library in most city homes. But, we can always create a reading nook. It is a refuge in the midst of a busy life. Here are some tips on creating one that you will cherish! Pick an area in your home which will offer you a bit of quiet and peace. Loads of natural light will do wonders! Top off the serene feeling with a small potted plant. For all those late night reads, ensure you have a well-placed reading lamp that guarantees comforting light. It could be a floor lamp, table lamp or a chandelier. Take your pick! The most important element is obviously the seating. When we talk about little reading nook we immediately picturize a comfortable chair that you can sink into. Take your pick. A rocking chair, arm chair, day bed, chaise or even bean bags on the floor…all these options can work. The only requirement is that the seating needs to be comfortable for long durations. For the sake of comfort, indulge yourself if you must! A pillow that could support your head or elbows would be fine. If a footstool helps, why not add it? Well..obviously! You may have a full-fledged bookshelf in the area. In that case the reading nook would be a kind of mini-library itself. If space is a constraint pile up the books on a ledge or table. You could put them in a nice wicker basket. A little touch of green with a small potted plant, a few bookish knickknacks or flowers and candles.. decorate the space a bit and give it your own personal touch. Let your very own reading nook transport you to a world of books and beyond! ‘The Narrators’, an initiative by Reshma Jain, gets literary gems on the wall in form of beautifully designed book posters. In short, get the text of your novel in the form of a poster. For any book-lover, no wall art can beat this! These posters are very unique not only because they carry the entire text of the book, but also because the shape of the text reveals a motif or design that is crucial to the theme of the book in question. The idea of having book text on a poster is very novel. I understand that for you, a Pride and Prejudice book poster did it! You received the poster as a gift from Berlin-based designer Peter Morcinek and this started the process of taking this up as a business idea…. I loved the poster and put it up immediately. Everyone who would come home used to be stunned and would ask for a copy! So, Peter and me decided we should exhibit it in Bombay. Peter’s friend in London, Carl, and his team were the main design team and for very customised prints like The Bhagwad Gita, Peter designed it. So, the book posters are marketed under The Narrators? How can people approach you for buying these? They can email me on [email protected] if they want to personalise or customise a book or a song for the poster. How does a book poster enhance the décor of the house? That is a question any book lover would answer easily- that a book in its original form or as an art form can only enhance any wall and any shelf! It is an extension of all that one is! Do you design them yourself or are they sourced from somewhere? The original black and white prints are sourced from England. We also customize and personalize in-house. What are the future plans for The Narrators? For a brief season we did book lights and ‘booknitures’ – little felt tables which fold into a book shape when not in use. We are involved in a variety of activities. The narrators are basically a bunch of journalists and designers and together we do books, biographies, commissioned writing, short films and so on. Book posters are indeed exciting artworks for any book-lovers wall! We wonder what’s next for The Narrators? SpinTales takes storytelling to an enchanting level. With a duvet that immerses the child into an augmented reality experience and a rug that takes interactivity to another level, this product is a game changer indeed! Narendra Ghate, Chief Designer Research, Service Design & User Experience Design, Tata Elxsi chats with Bookedforlife about this fascinating concept. The concept of using augmented reality on fabric is interesting. Can you talk about the genesis of the concept? Augmented, Virtual and Mixed Reality are some of the futuristic technologies, which several industries are adopting. Welspun – one of the largest home textile manufacturers is one of the forerunners to adopt the augmented reality technology in textiles. Welspun had a vision to launch smart textiles for storytelling for children. The idea was to make home textiles more than just an upholstery, and make it more immersive and engaging for kids. Tata Elxsi was a preferred design and technology partner of choice for Welspun. We helped Welspun to envision their idea to reality. The Duvet and Rug are interactive and innovative textiles for kids, age three and up. The experience is uniquely interactive for both children and parents, with a focus on multi-dimensional storytelling, educational activities, and Augmented Reality. It is an experience that kids love. By scanning the specified markers on the rug or duvet (using a tablet or smartphone), children can view characters in Augmented Reality. It feels like you are part of their world and you learn a bit more about the world they live in. SpinTales is the first of many experiences that is introduced and launched by TILT. Right now, the story options offered are Little Red, Three Little Pigs, and Jack and the Beanstalk. Any plans to increase the number of stories? The above-mentioned stories are available in the interactive duvet. In the interactive rug, one will find jungle themed stories. Currently, three different stories are available in the rug and the duvet. The number of stories are expected to be added soon. How do the activities in the duvet and the rug differ? The activities are based on the stories, which are similar in nature. The duvet for instance has activities like Little Red Riding Hood baking cookies. In the Jungle Rug you will have this character Milo making fruit juices. The difference is mostly in terms of ergonomics. While playing with the rug, the child will be standing, but while using the duvet kids would be mostly lying down on the bed with the duvet covered on them. Hence, from a design aspect we had to consider the height from where the duvet / rug is accessed. This is to ensure that the markers are detected when the tablet / smart phone is pointed at the rug / duvet. Coming to some practical questions: any special maintenance requirements for the fabric or can it be washed normally? Users need to follow the washing instructions as specified by the brand – TILT. Most parents nowadays try and keep kids off gadgets, especially at bedtime. How do you feel this product actually enhances their experience with technology, without bringing in its side effects? SpinTales is targeted for both playtime and bedtime. Instead of being a purely digital product, SpinTales connects the screen experience with physical activity. To experience the beauty of Augmented Reality technology, one needs to move around. This is gives users to not just involve in physical activities, but to also enjoy the benefits of digital technology. In addition, there are specific games, which encourages users to get involved in more physical activities and exercises. For instance, there is a game called ‘Frog and the Yoga poses’ which will encourage kids to emulate the yoga postures done by the frog. Also there is an Augmented Reality game where kids need to collect flowers by walking around on the rug. Are there updates to the app since beyond a point children may get bored with the same activities? Yes. The plan is to add more stories with fresh content and new activities. The app will be the same but the content will be upgraded. For instance, there might be bonus chapters in future for Christmas and Easter etc. How has the response been to this product in the Indian market? Can you share any experiences or customer feedback? The feedback for SpinTales has been amazing and has been well received from both parents and their kids alike. SpinTales was initially launched for the US markets but it is also now available in India in stores namely Hamleys and Home Centre. SpinTales has brought an innovative concept to merge the worlds of storytelling and technology. Time will take the magic to new heights!